Officials say the new piling effort makes it easier to safeguard the Empire State Building, Space Needle, Metropolitan Museum of Art, Old Ironsides, Washington Monument, Brooklyn Bridge, Graceland, Indianapolis Motor Speedway, and the 2,524 other sites. BROADWATER, NE—In a move aimed at protecting the nation’s natural and historical heritage from potential threats, the U.S. Department of Homeland Security announced this week it had relocated all major American landmarks into one big, carefully guarded pile in the center of the country. Spanning 25 square miles in a remote section of western Nebraska, the densely packed, 5,000-foot-high mound is said to contain every prominent national monument, historically designated building, and notable piece of public infrastructure from across the United States. “From now on, making sure Independence Hall, the Trans-Alaska Pipeline, and Fenway Park are all safe and secure is as easy as doing a 20-minute perimeter patrol around the pile,” Johnson added. Observers confirmed that within the tight confines of the pile one can find such familiar national landmarks as the Hoover Dam, Willis Tower, all bridges and tunnels going into or out of Manhattan, the Lincoln Memorial, Kennedy Space Center, the newly opened One World Trade Center, Fort Sumter, and most of the country’s international airports. In addition, authorities confirmed all 50 statehouses have been relocated to the site. According to sources within the government, the new plan will greatly simplify national security efforts, as the area can be protected by just a couple dozen guards stationed every half mile along the pile’s periphery. DHS officials also confirmed that a chain-link fence has been erected around the entire site and that the barrier will be topped with razor wire, which experts believe will serve as an added deterrent. 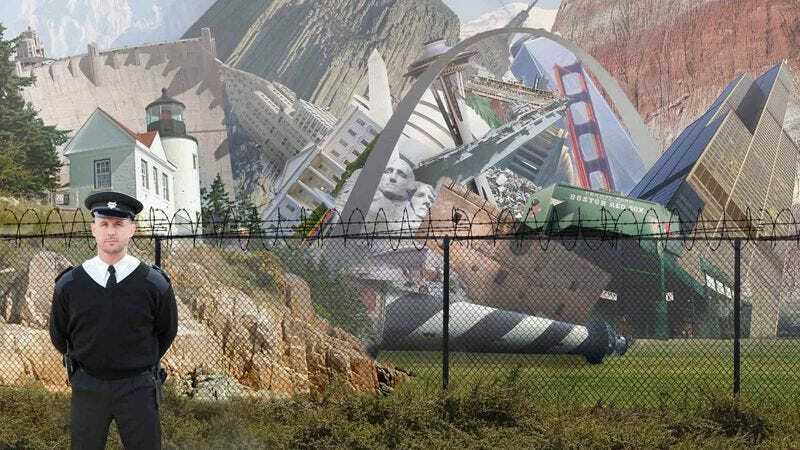 However, sources confirmed that the first tourists to arrive at the massive pile had issued few complaints, with many telling reporters they had enjoyed visiting over 2,500 national landmarks in one convenient location.